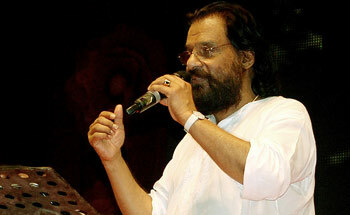 NEW DELHI: Eminent singer KJ Yesudas was honoured at the sixth edition of CNN-IBN's Indian of the Year. The legend received the award for his outstanding Achievement in Indian music having recorded over 50,000 songs in five-decades. Amitabh Bachchan also received the award for redefining the genre of reality television and an outstanding presentation style. The guests of Honour at the event were former Attorney General of India Soli Sorabji; Sir Mark Tully; former Chief Justice of India Justice JS Verma; former cricket captain Krishnamachari Srikkanth; Major General Lacchaman Singh Lehl, Commodore Vijay Jerath - Vir Chakra and Brij V Mahalingam of 16 Madras. Awards were also given away in other categories including political, public service, business, Indian of the Year award. Lifetime Achievement Award, and other categories.